Blinds are a great option for those looking for window treatments for their home or business, but to keep your blinds looking their best, you are going to need to clean them occasionally. If you have basic metal or vinyl blinds, you will be able to do this quite easily with a traditional duster or a cloth. However, you may need to take additional steps if you have a slightly more advanced type of blinds on your windows. But regardless of which blinds you have, it shouldn’t take you very long to get them clean. Whether you have wooden blinds, fabric blinds or vertical blinds, you should get into the habit of vacuuming your blinds across the slats at least once or twice a month, notes HGTV. 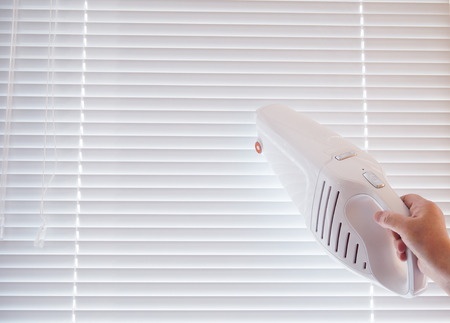 This will prevent dirt and dust from building up on your blinds and reduce the risk of your blinds staining. In the event that you do experience staining of your blinds, perform a spot cleaning with an all-purpose cleaner and a dry cloth. You should never, ever spray cleaner directly onto your blinds, though, as this could make the problem worse. In the case of fabric blinds, you have the option of taking them to a dry cleaner if multiple stains set in or they become very dirty. You can also remove metal and vinyl blinds and take them outside to be cleaned with several drops of dishwasher soap and a car-washing brush. Different blinds call for different cleaning techniques, and you should research the best ways to clean your specific type of blinds if you aren’t sure how to do it. If you ever need your blinds repaired or you simply have questions about how to clean and maintain them properly, you should call on Boca Blinds for help. We have 40 years of experience working with a full range of window treatment options, including blinds, shades, shutters and more. Our experts know how to care for any type of blinds on the market and can help you with repairs or replacements, as well as finding new blinds for your home or business. Call us today at 561-368-5322 and learn more about our full range of products and services.